Asp.Net MVC is a great way to get dynamic data presented inside a web browser and thanks to the great integration of jQuery now in Visual Studio, we have many programming tools right at hand! To show of the possibilities, I’ll give an example on how to get data from Asp.net MVC into your client jQuery code. This example will also use jqPlot to draw a dynamical graph from the given data. First up, you’ll need to download the jqPlot plugin for jQuery from the jqPlot site: http://www.jqplot.com/ ! I have to say, this graph plugin just looks stunning and is easy enough to use with much tweaking options!! When this is done, create your MVC project inside Visual Studio. To get jqPlot working in your MVC project, make sure to create a subfolder jqPlot inside your Scripts folder and copy all .js files from the jqPlot download inside this subfolder! After that, just add following inside your Site.Master page to get the correct reference to your jqPlot plugin. Small side note, when you need to edit js files inside Visual Studio and you like to have intellisense for jQuery, be sure to add following line on top of each js file! Add following code inside the controller, this will give us the new web page. The class used here is called GraphData, it’s created inside the Models section and only contains 2 properties. Now that the code is in place, right click on the HearthRate() method and select Add View. This will create a new view inside the Views section. 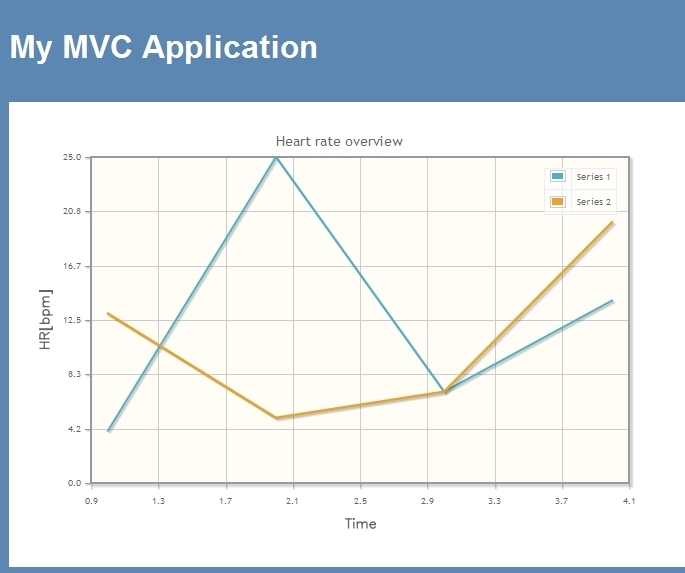 Edit this newly added View ( this example Views>Graph>HearthRate.aspx ) and add following code inside the asp:Content tag! This div will be used by the jqPlot, it indicates where the graph needs to be visible. The other line is a reference to a new js file that we need for processing the JSON data and presenting it correctly to the jqPlot plugin. Now the only thing left to do is create the js file with all the jQuery code that will process the JSON stream and draw the line chart. With all this in place, you can start up your website and browse to the http://localhost/Graph/HearthRate site. If everything goes well, you should get following image. I just had to post about this little tool ! I think all people who are busy in software development using .Net, should at least have a look at it ;). What am I talking about, well, a small tool called ILMerge. It’s available from the research part of Microsoft. So what is it about ? Best way to explain a tool is by giving an example : Imagine you have several .Net projects that, all of them, create separate dll’s ! This is not uncommon and you probably designed your projects this way, because they reflect some sort of internal business architecture… so no worries here. But on the other hand you probably also have some solutions that incorporate several projects, who have some kind of common link between them. So wouldn’t it be nice if you could get all those projects, that are linked one way or another, inside one dll instead of separated ones ? Well with ILMerge you can accomplish this ! It will combine several input dll’s into one target dll or even better, combine an exe and several dll’s into just one exe ! Another example is to combine code dll’s together with their resource assemblies ! This procedure is of course only relevant for deployment of your software, so developers don’t have to perform this step and still can program with the complete original dll base ! But before packaging the software, it would be ideal to merge several dll’s to get a cleaner, smaller install package. I recently started using the new Theming features of asp.net 2.0 and I have to say it works like a charm ! But what to do when you want to disable everything for one page ? I searched the internet for a solution but found none ( maybe I didn’t look very good ? 😉 ) ! I know there are 2 page directives that help setting the themes, but to disable them I only found one ! But the EnableTheming will only effect the choosen theme and will not effect the StyleSheet theme !! Even our friend the intellisence didn’t offer me any clues… When you type Theme=”, it will show you a list of available themes, so you can choose one from it. So I was stuck and needed this feature for the default.aspx page of a small website I was building. But like many other solutions, this one also came by accident ! When I was trying every combination of theme and stylesheet, I just ( for the fun of it ) entered 2 empty string sequences, to see what the result would be… And tadaaaaa, what did I get, a default.aspx page ‘without a theme and stylesheet theme’ !! !